I recently realized that what I’m most inspired by these days is the ability we all have to adapt. My Facebook feed informs me pretty much daily of friends getting hitched, divorced, having kids, and losing parents. This life can be so brutal and so beautiful all at once sometimes. And, well, so can cooking. You take what you have and you try to make something better out of it. You teach yourself, you adapt to the constant struggle by creating a new moment in which you get to start from scratch. Every life problem can’t be manifested in the kitchen, and it’s certainly not everyone’s solution to working out sadness or stress…but I’m lucky enough that it’s mine. I know I’ll find a way to fit this in next year. I get the same joy out of making food that some others I know get out of making music, stitching clothing or building toys. It’s all creation. And holding something in your hands that you’ve made, whatever it might be, can go a long way to negating that brutality and remembering what’s good. Creation. Care. Patience. Flavor. 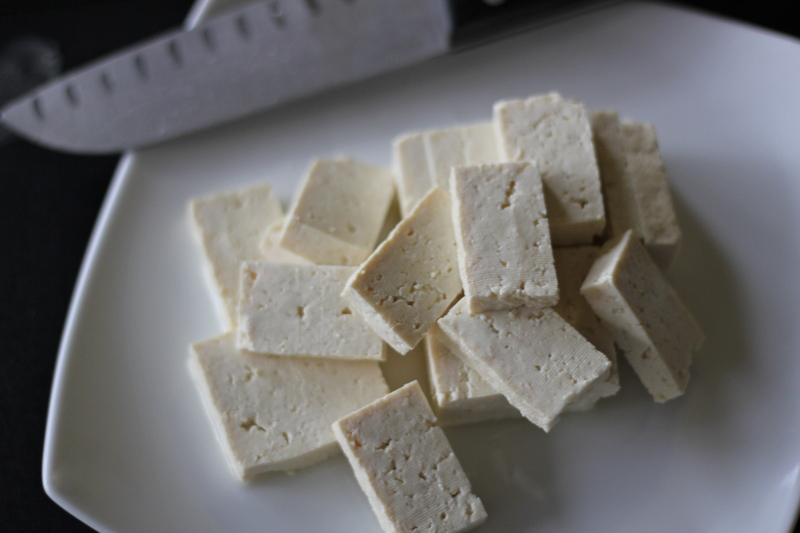 Today’s recipe is brought to you by my amateur philosophy and my deep, unending passion to try and get tofu to taste good. This method was born out of necessity (I had just moved and had nothing else in the fridge but these condiments and a week-old block of tofu) and has become one of my favorites. Tahini is relatively easy to find these days I think—it’s just sesame paste. And this ground fresh chili paste has become a favorite—vinegar and salt make it full and flavorful and mouth-wateringly spicy. Again, I urge you to find an Asian grocery in your area and stock up. You cannot beat the flavor. I like to serve these with some lightly sauteed veggies and brown rice, but they are pretty tasty the next day in a pita with some cheddar cheese, hummus, avocado and spinach, too! If you want to save a few, it’s best to cook them all at once and divide them at the end, rather than have them sit in the marinade overnight and then have to cook them the next day. They reheat in a flash and they’re tasty cold, too. Make a big batch today, have some for dinner and throw the rest in lunches for the week. Note: The flavor and texture won’t improve after two hours or more in the fridge. This comes together so quickly. I usually just make it at the beginning of my dinner prep and throw it in the pan right before serving. When frying it, don’t crowd the pan! If you dump it all in at once, the temperature of the pan will drop and you won’t get even browning. In my favorite 10 inch skillet I can fit about 8-10 pieces at a time. 1. Pat tofu dry with paper towels. I usually leave them to drain while I get everything else ready. 2. In a shallow bowl or small plate, mix the rest of the ingredients together. 3. 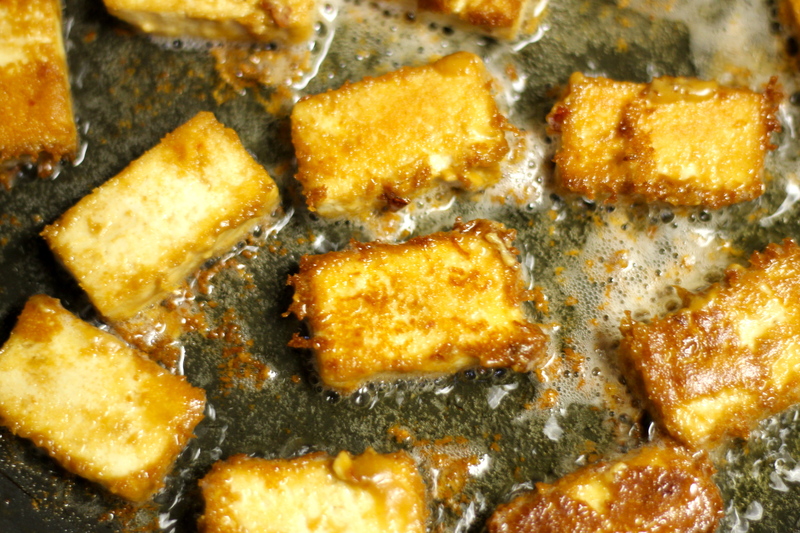 Give the tofu one more gentle squeeze and then discard the towels. Carefully add it to the marinade. You want the mixture to cover all sides of each piece, but if you handle them too roughly, they will break apart and you will have trouble cooking them later. 4. Cover the bowl or plate with plastic wrap and set it in the fridge for at least 30 minutes (see note). 5. Heat a large skillet over medium heat. Add the coconut oil (I usually use about a tablespoon, but the more you use the crispier of a crust you’ll get!) and let it coat the pan and get nice and hot (usually takes a minute or two). 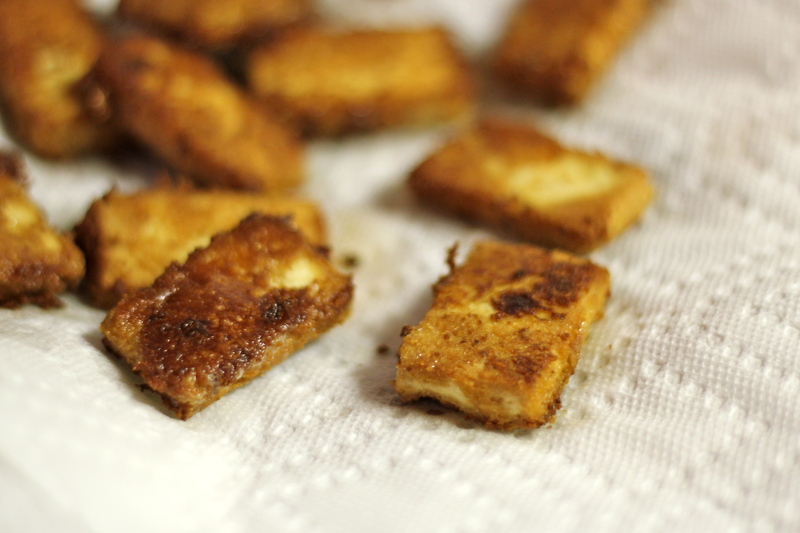 Add the tofu one piece at a time. Let them sizzle for three minutes on each side. You can check them for browning as you cook, gently. Pay attention to where the first ones went in and check & flip those guys first. 6. As the pieces crisp up, remove them to a plate (if you’ve used a lot of oil, line the plate with paper towels first). When you’ve got them all cooked, especially if you’re serving right away, scrape your skillet over the plate and get all those salty, crusty crispy bits that clung to the pan. They’re sometimes the best part! 7. 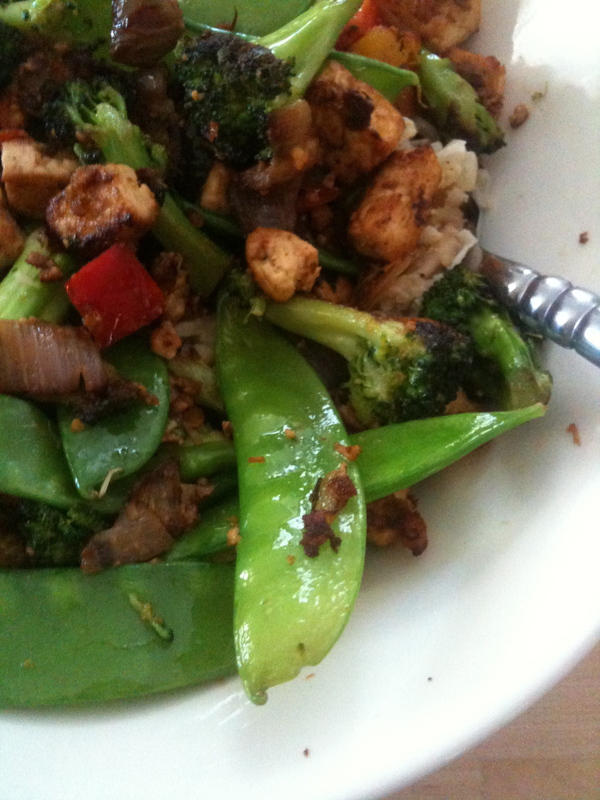 Serve over rice and vegetables if you like, passing more soy sauce at the table. 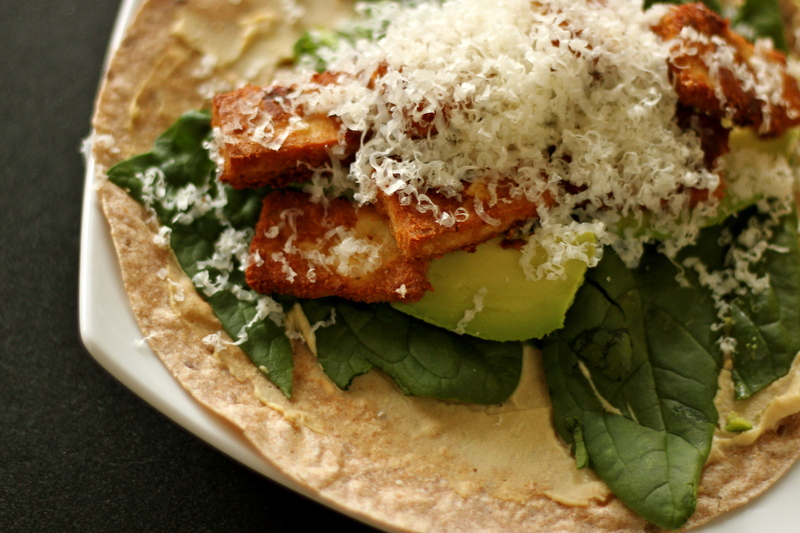 Or spread a thin layer of your favorite dip or dressing (I like hummus) on a tortilla or pita, and add sliced avocado, spinach, and grated sharp cheddar cheese. Sprinkle in some hot sauce and eat on the go. 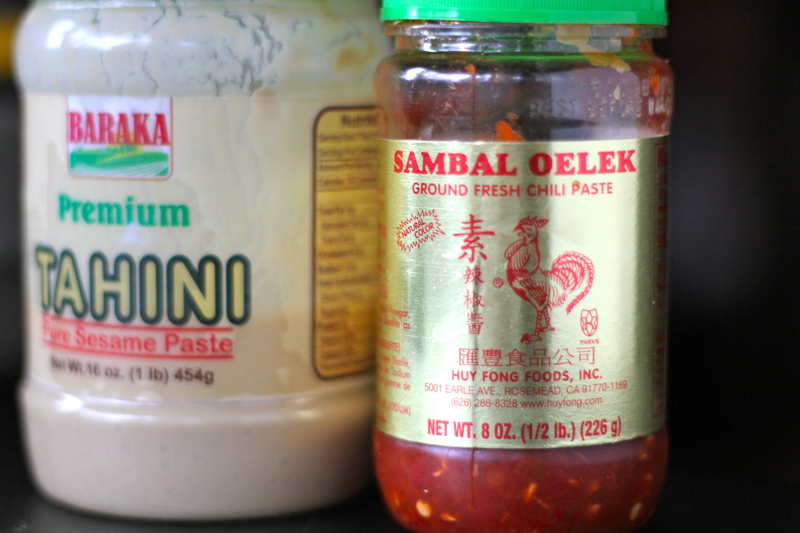 I love that sambal too, but I never would have thought of combining it with tahini! This looks like a delicious marinade. Thanks for the recipe–and congratulations on being grad-school-bound! it was one of those mistake discoveries, a total guess. thanks for the congratulations and the sweet comment! More soy free vegan recipes, please! I’m so glad things are going well for you, Carol. Congrats on getting into grad school! Of course, I knew you would! 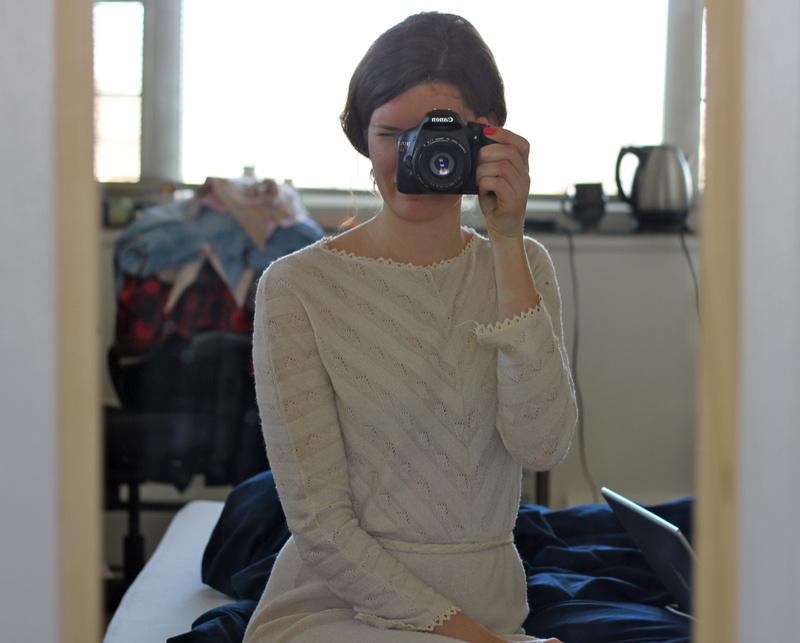 I’m glad I ran across your blog. i’ll work on the soy-free vegan recipes (you should send me some to try!). miss you gorgeous! And yes, I will have to send you some recipes. I’ve got a few on my rookie blog here.